We hope everyone is enjoying their summer. It’s usually a time when home and family nudge modeling aside for many of us. The Resin Car Works crew thought you could use an update on our current kits and a sneak peek at some upcoming ones. 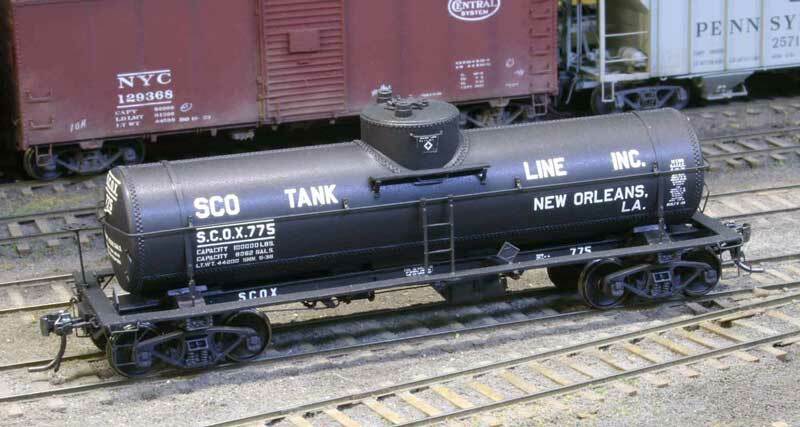 First, stock is getting low on our latest kits, the special edition GATX Type 30, 8,000-gallon, Class 103/203 tank cars. The SE 1.01 – SCO Tank Car Lines kit and the SE 1.02 – Clinton Company (GATX) kit each have fewer than a dozen kits remaining. 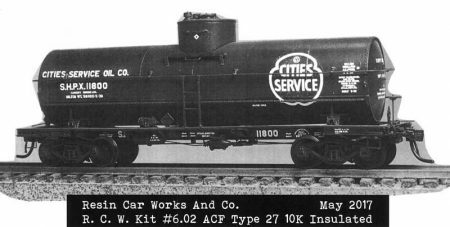 The Kit 6.0 – AC&F Type 27, 10,000-gallon, insulated tank car models are also running low. Here are the kit numbers and details. We share this data in case anyone forgot these models are available. We hear you when a model is discontinued. We post this info so modelers can take action before the kits are gone. Visit our website. Please print out and complete the order form with the proper item code and quantity, then send it in with payment to the address on the form. Yup, it is old school. PayPal costs extra, just like using a credit card, in case you did not know. But these kits are on hand and will ship quickly. Boiler loads and grain bins are also in stock! And don’t forget about our decals. A few models are in the mix for release in the upcoming months. 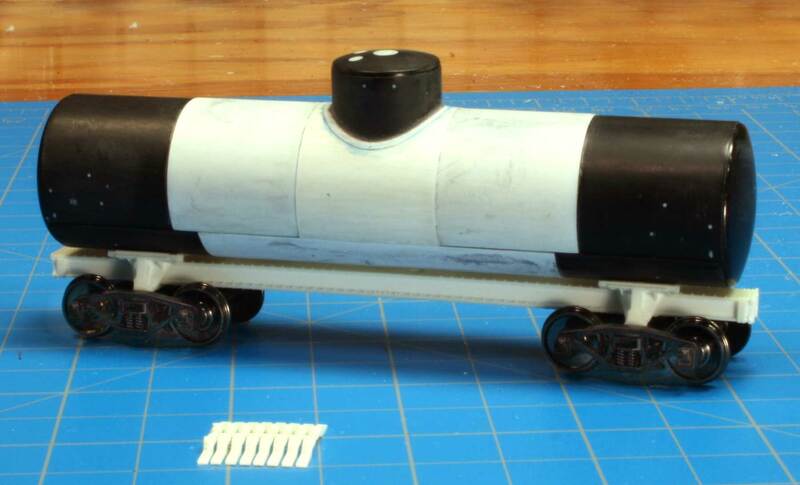 Above is a mock-up of our UTLX Class X 6.5K gallon tank car kit. The RCW minions are working hard to have these available at the October RPM Conference Chicagoland. Here’s a look at the 10K gallon version of the Class X tank car kit. The frame, bolsters and running board supports for both versions were done in 3D by Frank’s son, Patrick. The parts are matched to prototype drawings of the Standard Steel Car Company. Besides the resin parts, the kit will include brass stanchions and corner ladders from Precision Scale Company and etched tank bands. Decals have been printed and the PSC parts are on order. Here’s a close up of the running board supports. It’s a little fuzzy but there are some details there. We looked into casting these in brass, but the kit price would have increased quite a bit. This is an SFRD rebuilt reefer and a redo of Charlie Slater’s car that Martin Lofton issued with Sunshine Models. 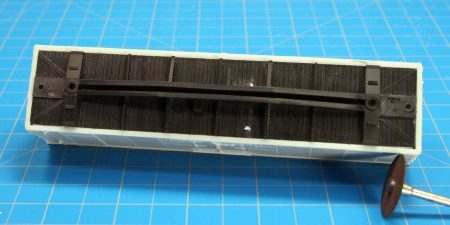 The kit will include photo etched running boards from Plano Models and photo etched detail parts from Yarmouth Model Works. Decals are from Ted Culotta. The kit will have a one piece body mounted on an Accurail USRA underframe. SFRD rebuilt over 10,000 USRA reefers of which the Rr-35/36/39/40 class cars were a small portion. These classes were the first post-war rebuilds with reinforced eves and doors so they’re different than the InterMountain model. 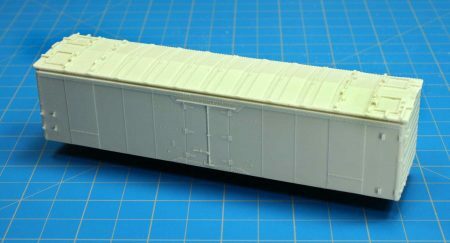 This box car kit follows the Great Northern double sheathed 10-foot 0-inch interior height design, which the road started building in 1937. Besides being a one piece body the kit will have a new correct underframe as per the article on these cars in RP CYC #23. 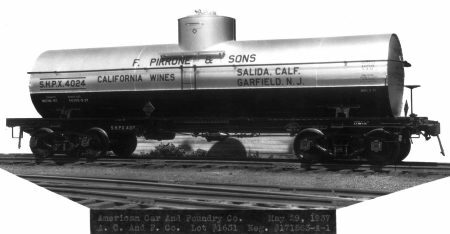 These cars where not based on the 1937 AAR design, but were closer to an ARA boxcar from the 20’s as the center sill was built-up with channels and plates. The kit will include laser cut running boards from Yarmouth Model Works and decals from Ted Culotta. The SFRD reefer kit and the GN box car kit are tentatively set for a late 2017 release. Image from Frank Hodina collection. Who needs some Milwaukee gondolas? 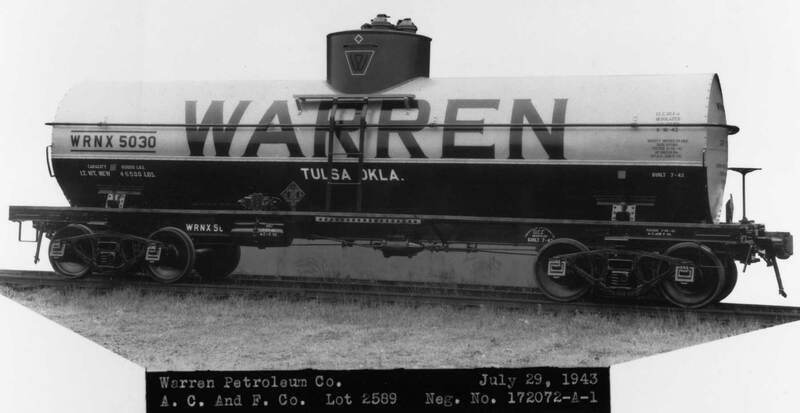 These unique 50-foot general service cars were built in 1937 and have not been offered before. The Milwaukee built 1035 of these in their own shops. These gondola models are tentatively set for release in early Summer 2018. Lastly, we are working on AC&F 8K gallon, insulated tank car models in a few lettering schemes. These are similar to the 10K cars and have tanks and domes done by Tom Madden in 3D. All the parts are done. We are tentatively planning to release these in early 2018. Here are some of the possible paint and lettering schemes. That’s all we can share at this time. Additional goodies are in the mix but the models noted here should all be released in the upcoming months. Please note the release dates are tentative. We have many people helping to produce these kits and personal issues can delay production aspects. Don’t forget the current models are in short supply. Order yours now as we are focusing on producing some great new models. Terrific–I’m going to want about 3 of the SFRD reefers plus 2 or 3 of the GN cars. Will the 10k X-3 tank cars be re-run? I’ll buy several X-3’s if they’re released again. Is the Milwaukee gondola also an early 2018 release? The blog is a little ambiguous about that kit..
Is there a way for those of us in Canada to order RCW models? I missed out on the 10k X-3 and I’d really like to not make the same mistake on the GN wood side boxcar (and possibly the insulated 10k type 27). Please advise and thanks for all the work you guys put into these kits! Nice selection of prototypes in your forthcoming kits. Approximately when will the reefer be available? 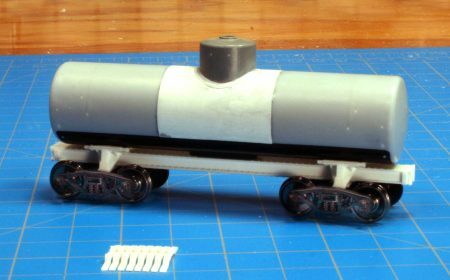 Sign me up for one each of the UTLX class X tank car kits. I literally just got done with a 6500 gallon car using the shapeways frame and an MDC tank. What about the trucks? I am also looking forward to the GN Box car and MILW gondola. That Milwaukee gon sure has my attention!!! Some nice things coming down the pike. Thank you! 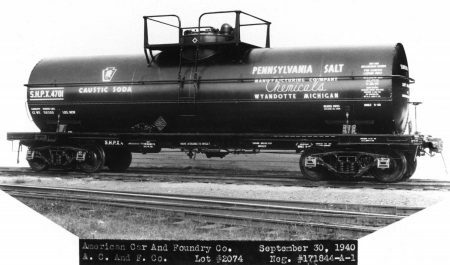 Are the new UTLX X class tank cars, 6.5k and 10k gal, the same as the Sunshine models that Martin did some years ago? Eric, the older Sunshine kits modeled UTLX class X-3. 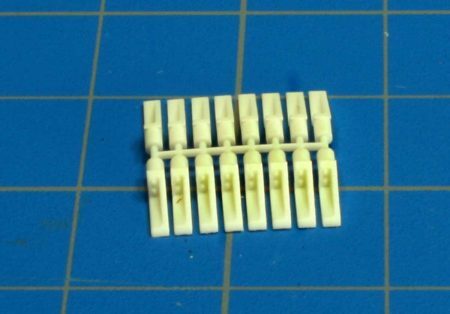 These new Class X tanks from RCW model older prototypes, with the raised running boards. I’m in for the Milw gondola and GN boxcar. I am looking forward to the Great Northern box car. I am especially interested in the rebuilt reefer and the GN box car. I am very impressed with the amount of new releases that will be available in the near future, especially the tank cars. I am especially interested in the Type X tank cars and the MILW gon.